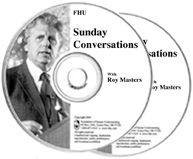 Roy Masters himself was quite taken with this particular talk. He makes the comment that what takes place is not seen elsewhere in religion or otherwise. Along with the great humor, there is so much here that can help you. Amazing things happen with the audience. You see and hear the evidence of programming, but you also see what it is to be free. One man eloquently described how he was stuck, and how Roy was able to help him. As you’ll clearly see; he is programmed no more. Who or what are you addicted to?